Discussion in 'Gen 3 Prius Care, Maintenance & Troubleshooting' started by Johnsmith009, Mar 12, 2019. The absolute first mechanical thing I do and I screwed up. Tried unbolting the 12v. Turned the bolt the wrong way (tightened, I've never used a ratchet before). The top came right off, the rest is stuck. How do I even fix this? The clamp should be loose, with the head snapped off. Try pulling the clamp off the battery post, just for safety, then see if you can get the remnant turning, screw it out of the clamp. If it's jammed drill a ways into it, then intensionally try to jam the drill, see if you can get it turning. It'll likely be an M6x1 replacement bolt you'll need, which you can get at major hardware stores. Bring along the remnant, to check the thread diameter/pitch. otherwise, you'll need an easy out. idk anything about load testers, but i suppose it depends on the load. it doesn't take much to start a prius, boot up the computer and close some relays. if you got 12.6 after it has been off overnight, it's probably fine. Yeah, look for "screw extractor" sets. Most hardware stores should have them. You drill a pilot hole into the broken-off bolt, then drill into the pilot hole with the extractor bit. It has left-hand threads (opposite of normal bolt), so it bites in, grabs the bolt, and spins out. Hopefully. A friendly mechanic heading home offered to drill a new 10mm right beside it. Whatever works. First thing done, throttle body clean. Three (ish) rags of residue, yum. Didn't expect something so simple to fix it, but at least I think it marginally improved acceleration. Fun note; it is extremely difficult to work without the tools for the job. I'll try the fuel cleaner soon. Never throw out old tee shirts or towels, sheets (especially flannel): you can rip them into rags for the car. Same thing for old tooth brushes, they come in handy. Update, had the battery formally tested (Not a cold test). I think it's fine (Or at the very least not the current culprit). Fuel tank halfway through. No reports on FIC effectiveness. Idle is much more frequent now, and often isn't just a low rumble anymore, it raises rpm as if I just floored it in park. Haven't measured instantaneous mileage when it does that but I imagine it's bad. 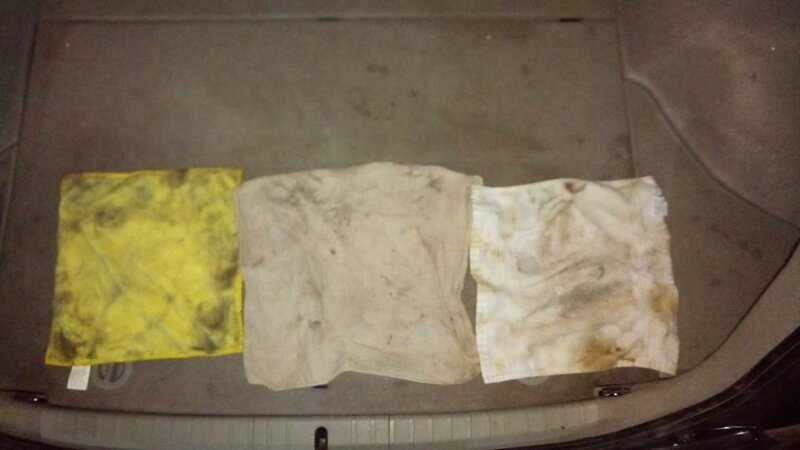 Going to clean egr pipe (and hopefully entire egr) tomorrow. Can't wait until I have enough to get a formal tool set. Mixing and matching from friends is very tedious. Cleaned the EGR pipe and unit, took 9 hours. It was pretty gunked up, about the same amount in Nutzaboutbolts's video. I'm running out of options here, why is my engine doing this? Attaching some Torque screenshots. Going 90km/h, 100km/h on a highway with pedal almost into the PWR indicator? 3.5, maybe 4. Going 4km/h in the parking lot? You'll be out of fuel in no time. 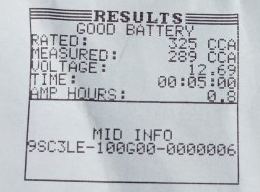 A battery that reads slightly below rated CCA, to me at least, that's a battery that's not in good shape. A typical new battery, at 100%, will show CCA well above rated. You cleaned the whole EGR circuit, including the pipe, valve and cooler, everything highlighted? That's impressive, especially for a guy that just the other day was snapping the heads off battery clamp bolts. I'm running out of options here, why is my engine doing this? Have you removed and cleaned the intake manifold, I'm losing track? It is the last leg of the EGR circuit: the EGR pipe feeds into channels in the intake manifold, and they can just as gunked up, if not more. There's one small diameter EGR passage at each intake (4 in total). You really want to clean the complete manifold (PCV goops it up too), and pay attention to the EGR passageways. Oxi-Clean solution is good for that. To keep the PCV circuit from filling up the intake manifold with oil/gas/water goop again, consider an oil catch can. Watch the @NutzAboutBolts video on intake manifold cleaning, too. 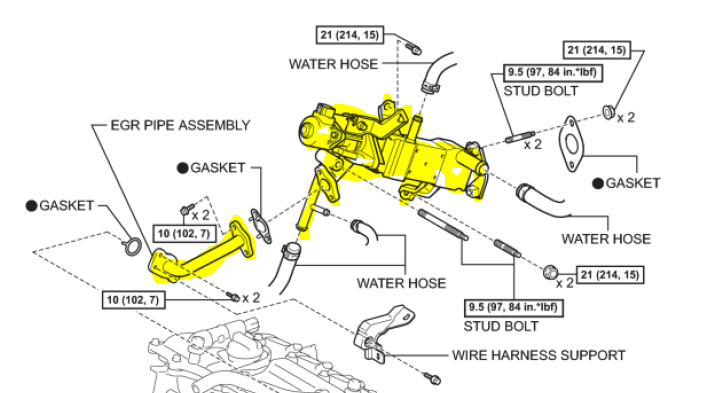 Attached is some Repair Manual info. Note, you don't need to remove throttle body coolant lines for intake manifold removal, you can just unbolt and lift off the throttle body, coolant lines attached. Tie it to the inverter, to get it out of the way. Be careful too, with torque values. I'd really recommend a torque wrench, 1/4" drive and 3/8" drive. The values for the throttle body hold-down bolts/nuts is 7 foot/pounds, which is really light, about the same as battery clamp bolts. You do not want to overdo these, they screw into brass inserts in the (plastic) intake manifold, they can break if overtorqued. Well, it's not in horrible condition. Not bad enough to cause something like this or warrant a replacement till winter. Correct, I cleaned the highlighted areas. I have not cleaned the intake manifold. 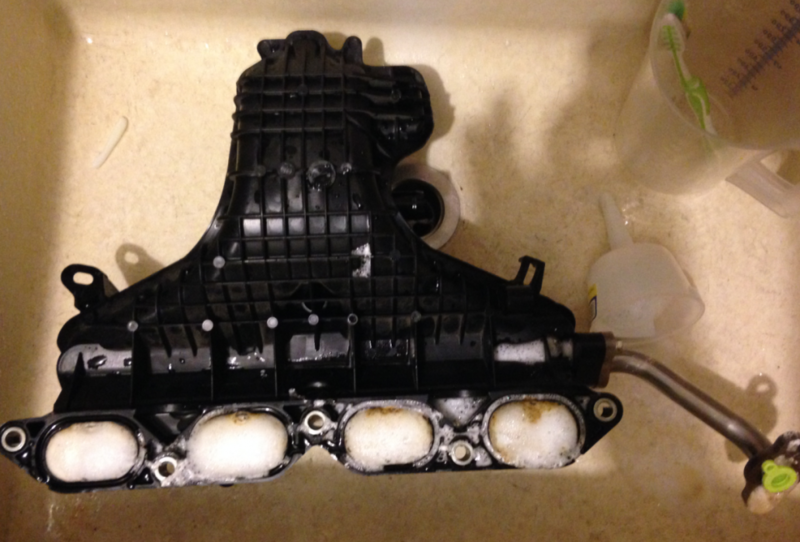 Pcv is part of the intake manifold cleaning? I've heard pcv can cause problems, especially 2010/2011. But will this really help? Egr clean did nothing. Plus, wouldn't a clogged egr circuit have poor performance on the highway too? Do you have any notes on my torque screenshots? Anything additional out of the ordinary? The last leg of the EGR circuit is those passages in the intake manifold. Until they're cleaned EGR flow continues to be restricted. The PCV is another input to intake manifold, can goop it up, maybe increases EGR carbon as well. The Manifold Absolute Pressure (MAP) sensor is down near bottom of intake manifold, below throttle body, tends to be really oil soaked too, by the PCV input. Not sure how this affects it. Ive cleaned with MAF (Mass Air Flow) Sensor Cleaner. Not sure about Torque readings, maybe others will comment. 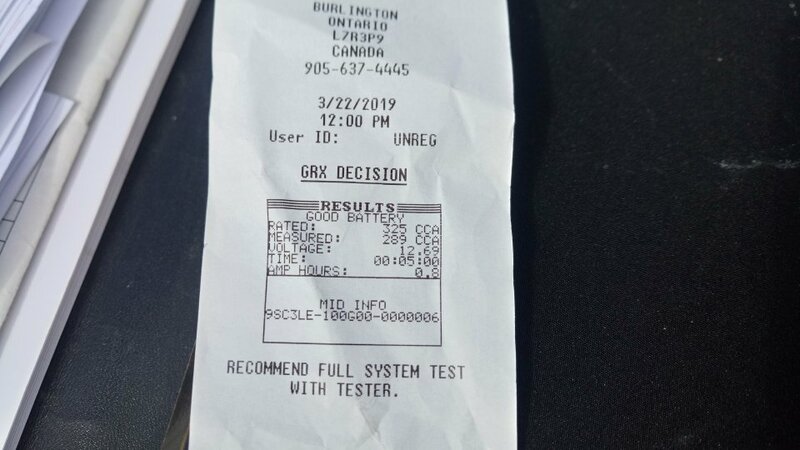 Car fueled up after one go-through with fuel injector cleaner. Can you describe again the symptoms; was it low mpg, poor acceleration? Rough idle, frequent idle (maybe? ), low mpg at low speeds, slower = worse (including 1km/h on pwr mode, thats the worst), Seemingly slow acceleration but I don't want to push it as it already seems to struggle. Have you calculated the mpg for a tank? I have not, but I doubt it's a software issue as ODB provides similar readings. Hold on, this is new, I don't know if this happened before or after the intake cleaning but I'm almost certain this wasn't on when the problem first happened. This sounds rather dangerous. Did I fail to assemble the intake correctly? If you didn't have this before, then you most likely didn't connect something. I remember reading a while back something similar and they have forgotten to connect a how on the intake manifold. line up where they are supposed to go. But you should SLOWLY go over every connection. Could just be a loose electrical connection. Grab everything you can get to to make sure it is connected correctly. There are two hoses which are connected to the vsv/purge valve on the intake manifold (they face the driver side of the vehicle). Check those two hoses. I gave up on the main problem and took it into the Toyota dealership. B) install summer tires to see if a "rotational noise" goes away (??? I don't hear a nose), if not may have wheel bearing noise. They couldn't find anything else. None of these would cause the original problems I'm having (charcoal is cause of evap leak), and they said so themselves. On a side note, anyone know where to get cheaper charcoal canisters? OEM is $1348.26+tax.